Crawford, Murphy & Tilly (CMT), along with EFK Moen, took home a Grand Award at the 2017 American Council of Engineering Companies of Missouri (ACEC-MO) Engineering Excellence Awards banquet on February 4, 2017. 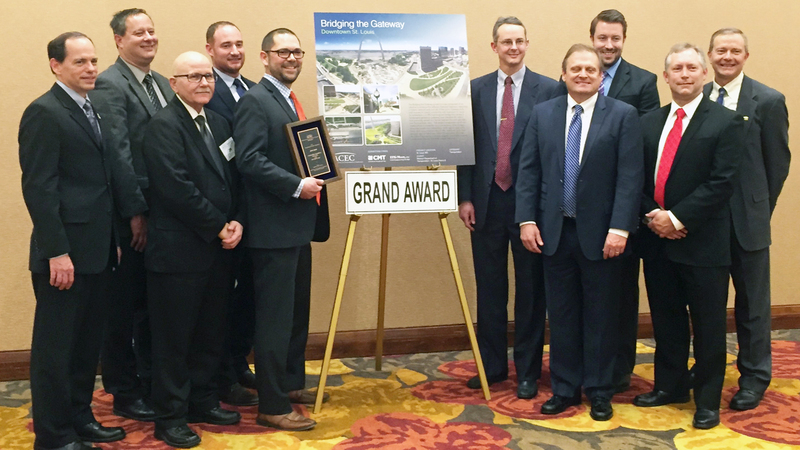 The Bridging the Gateway project finished in the top tier of awards and was runner-up in voting for the organization’s Grand Conceptor Prize, behind the Kansas City Streetcar Project. The Bridging the Gateway Project was the Missouri Department of Transportation (MoDOT)’s component of a grand initiative to connect, invigorate and expand the Jefferson National Expansion Memorial, site of the iconic Gateway Arch in downtown St. Louis. This nearly $30 million state project was coordinated between multiple agencies including MoDOT, the National Park Service, St. Louis City and CityArchRiver Foundation, a public-private partnership established to promote the $380 M transformation of the 91-acre national park. The centerpiece of the design was a 285-foot wide, 100-foot span land bridge termed the “Park over the Highway”. It carries a landscaped pedestrian greenway over the depressed section of Interstate 44, which previously served as a barrier between the arch and downtown. Also featured were new interstate ramp connections, two bridge designs and significant changes to the street network in downtown’s south core. The project team utilized the first known application of a Value Engineering Workshop targeted specifically to construction phasing and traffic impact reduction.